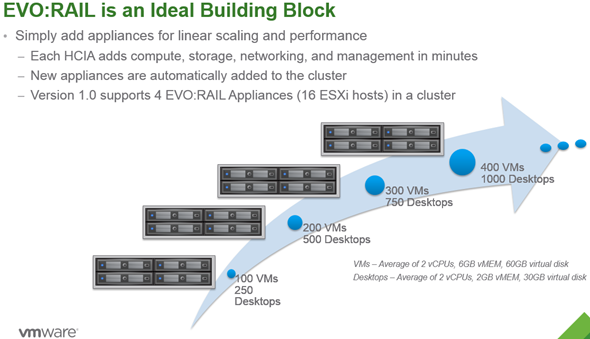 VMware EVO:Rail is one of the newest and hottest news that is announced by VMware. It’s a hyper-converged infrastructure appliance which consists of EVO:RAIL Software bundle and 2U 4-Node hardware platform. It’s not VMware who provides the hardware, so the thoughts previously written elsewhere that VMware goes into a hardware business are cleared out. No, it’s a hardware partners who will provide a EVO:RAIL compatible hardware and VMware will provide the software appliance. Before going into details, I’d like to point out that the systems will leverage VSAN technology as primary storage for the vSphere infrastructure. VMware EVO:RAIL is the software appliance which allows easy install (15min install time) of everything (ESXi and vCenter) and easy administration. 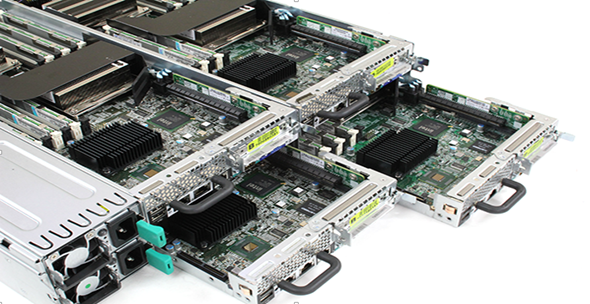 The hardware consists of 4 independent nodes (4 servers) which are in the same chassis. Each node is dual CPU and 192 Gb of RAM. As concerning the internal storage, the final capacity will be 16 TB and it will consists of Flash and HDD. As VSAN’s functionality is based on mix of Flash and HDD. I think that it’s important to note that included in the price will also be the phone and HW and Software support and services (SnS). So you’ll be buying single product where you’ll have Hardware + Software + Support. A single SKU. 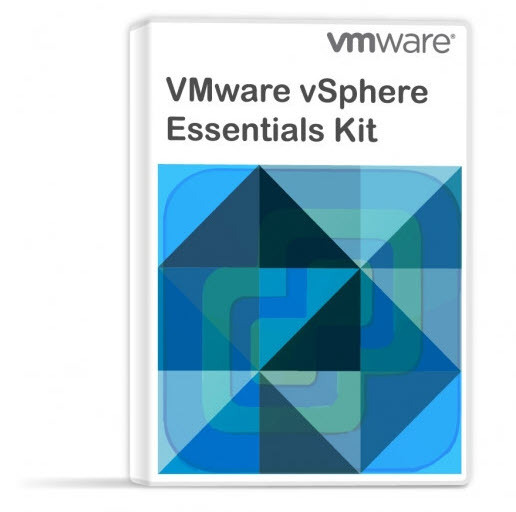 The software package contains vSphere Enterprise Plus, which also has vCenter Log Insight product. 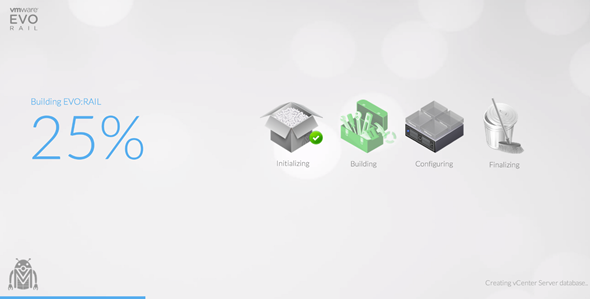 Expandability is possible – It’s possible to stack up to 4 hardware appliances in v 1.0. During the demo that I’ve assisted, we could see very nice and clean interface which was much more simple than vCenter for example when creating VMs through vSphere web client. But that’s the goal actually as it would be possible to put such a blocks into production at remote sites, with just basic IT skills. 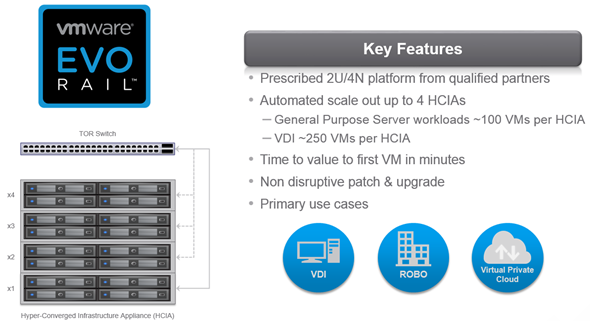 2U 4-Node hardware platform which is optimized for EVO:RAIL will be provided by OEM Partners. Note that the Top of the rack shall be a 10Gb capable switch which also be used with VLANs, to be able to activate the different services like FT, vMotion, HA etc…. 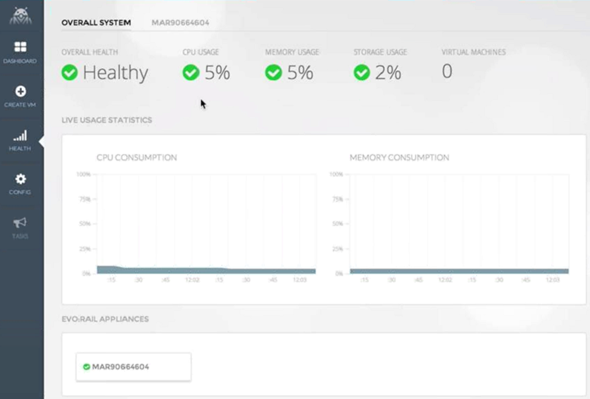 EVO: RAIL delivers the first hyper-converged infrastructure appliance 100% powered by VMware. 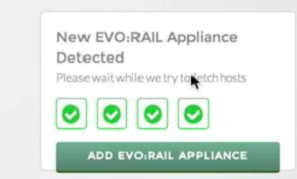 The EVO: RAIL software bundle is pre-installed on the partner’s hardware. No more Flash. A HTML 5 is leveraged to configure and manage the solution. So its possible to use ANY device with HTML 5 compatible browser. Upload Configuration – this option allows upload config from for example an USB stick. The config file is a simple JSON file based on XML. During the presentation, a video showing the installation process. 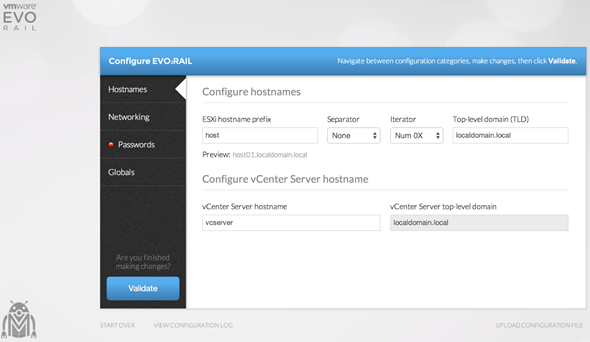 The EVO: RAIL software allows not only to install/configure the solution (ESXi and vSphere), but also the VM management where you can create new VMs and manage the infrastructure. However the UI is stripped down to minimum. Here is an example of creation of VM. You’re walked through a wizard which allows to specify size of the VM. 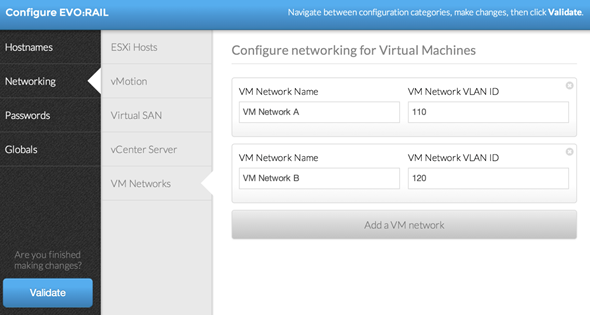 Not much where you can go wrong… -:) It looks like about anyone can create a VM with this UI. When the VM created, then its manageable through the UI as well, where you got few options, including cloning. Here is a screen showing the licensing screen and the options for Internalization… A single license key is necessary! 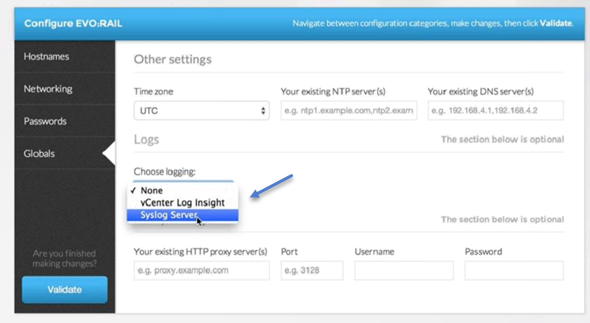 You can also download logs from the ESXi hosts, vCenter or from the underlying hardware. Concerning the evolution, it’s simple. 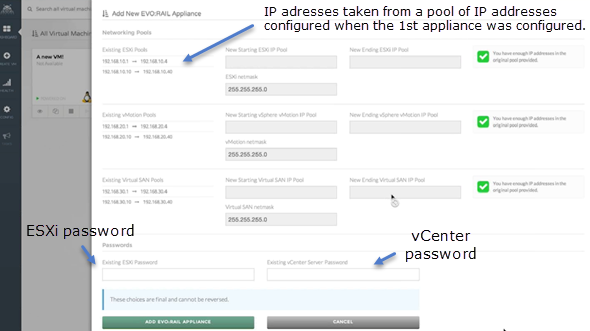 The initial configuration for v 1.0 is limited to 4 appliances (16 ESXi hosts), but shall be lifted in near future. Based on VSAN technology, the distributed RAID of EVO:RAIL can tolerate hardware failure without losing data or experiencing downtime. 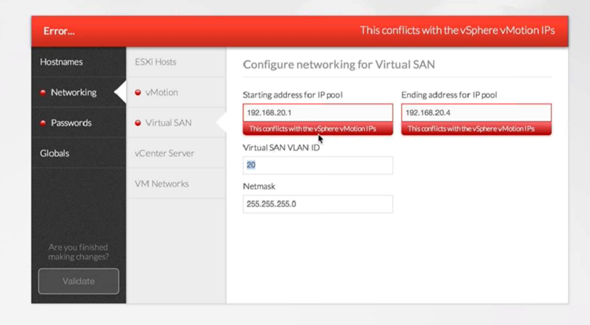 If any of the nodes goes down, then VSAN will start to rebuild the VMs that were running on the failed node. As mentioned above, the Top of the rack switch has to be 10Gb switch. VMware recommends to isolate all types of traffic via VLANs. VSAN requires L2 multicast (IGMP Snooping + IGMP Querier). IPV6 has to be enabled as well. Update: Thanks for Erik’s comment I googled a bit concerning the IPv6 and VSAN 1.0. New nodes are detected automatically..
And here another screenshot showing the integration with vCenter Log Insight. The system automatically detects that you have plugged-in and powered-on another appliance… Clicking the green button you see on the image bellow, just brings in another window. The IP address informations are taken from a pool of IP addresses which was created during the configuration of the first appliance. Very simple and very fast indeed. Project MARVIN previously mentioned on the Internet is actually the EVO:RAIL. The project started in January 2013. EVO:RAIL will be available in Q4 2014 through selected partners. How does it compete with others? Time will see as the hyper-converged market is full of other players like Nutanix, Simplivity, ScaleComputing, Maxta or recently Atlantis Computing. So the question is who will be the winner? Nutanix is in this space since few years and they do very well as they leverage global deduplication and compression out of the box. 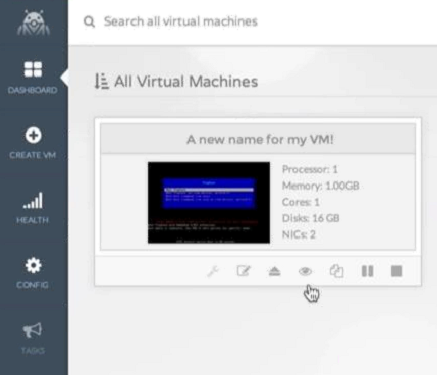 After looking at Atlantis Computing’s webinar last week, their USX 2.0 has those features as well, and in addition they support VVoLS and VSAN by creating an independent layer providing different storage services on the top of VSAN. VMware and VSAN in its first version does not have deduplication and compression. But it’s only a question of the time when those “efficient” features will make it in. Probably in the next release… Exciting times ahead! If you’re not present at VMword San Francisco, you can still register for VMworld Barcelona. Stay tuned via RSS or Twitter. Nice one Vladan. I had not seen any of the screenshots before. For the networking requirement, you might want to check your IPv6 info, I don’t think VSAN 1.0 supports IPv6 for the moment. Thanks Erik, stop-on-video-frame is for something for the screenshots. True I haven’t think of it and I’ve heard the info. Will try to get more details and update the post. Can you comment on how the EVO:RAIL software is licensed? 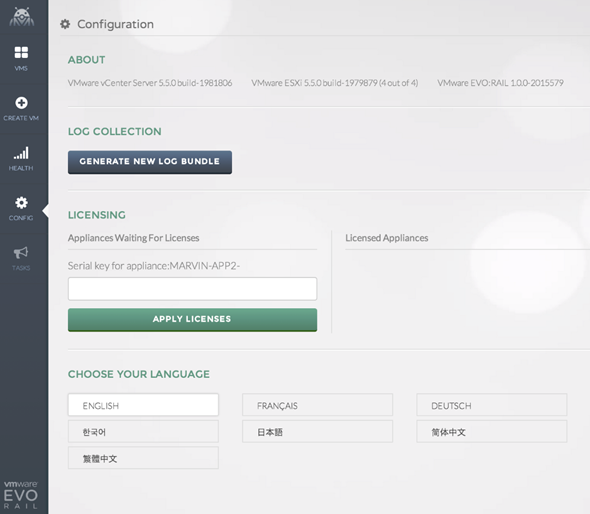 We would prefer to buy unlicensed from the VAR as we are VMware services providers and can provide our own licensing. All we need is just the hardware without the licensing and just wonder if this is the possible way to cut cost.